Coming from humble upbringings in South Africa, Gary Player rose to become one of the most successful golfers in the history of the sport. He has won 165 tournaments globally, 3 of those being the illustrious green jacket at The Masters. In one of the greatest honors of my life, on the eve of his 60th Masters appearance, Mr. Player and I caught up to reflect on a spectacular career. Chris Schembra: Mr. Player, with such a long career spanning 6 decades, when was the last time you felt burned out and why? 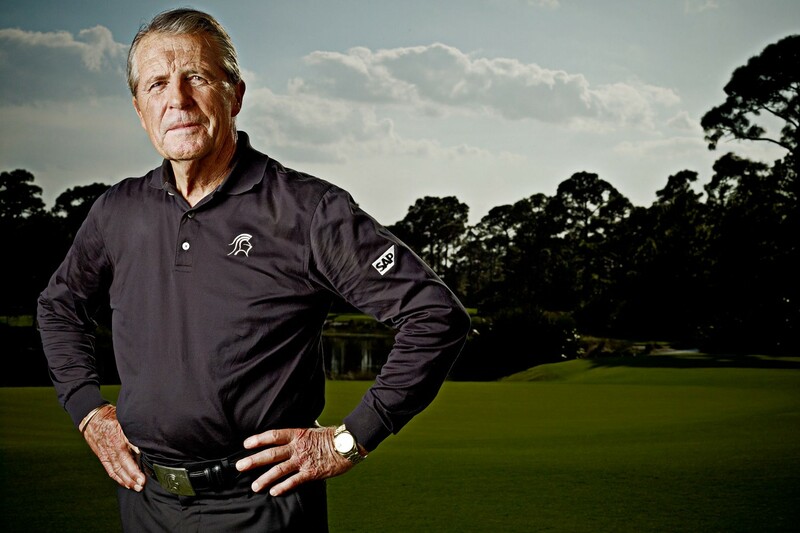 Gary Player: Chris, the key to not burning out is to have a good faith in life and you’ve got to have perspective. I’m a very happy person. I’m a great believer that you’ve got to work hard in life and persevere. I suffered like a junkyard dog when I was a 9 year old kid. I lay in bed, wishing I was dead because my mother was dead, my father was working in a goldmine, my brother was 17 years of age fighting in the war with the Americans and the British, and my sister was at boarding school. I’d come home to a dark house, had to cook my food, iron my clothes, run my life. It was the greatest gift bestowed upon me by God. That’s the reason I became a champion. Any time I thought about this inexcusable, burnt out junk, I just made a comparison of how I lived and how people are living in poverty. Having traveled more miles than any human being that’s ever lived, the things I’ve seen, how can you ever have the audacity to think you’re burnt out? Chris: I completely agree with you, life is truly a matter of perspective and understanding the feelings of others, especially the ones that you serve. Are there 2 people that have had a positive impact on your life that you just don’t talk about enough? Gary: I suppose Winston Churchill had a great bearing on my life, when I think if it wasn’t for him, you and I wouldn’t be talking today. Here is a man that lived through enormous adversity. When you think of September 11, which was so bad, he had to live with that kind of thing almost on a monthly basis, and the responsibility of how he inspired people. I used to lay and listen to his tapes and it was so inspiring. My favorite speech of his was “Never Give In” at Harrow Hall in 1941. Another remarkable man in my life is Nelson Mandela in South Africa. He went to jail for 20 years and yet came out and had no revenge for the White man, no hatred. We spent a lot of time together and raised a lot of money for young children in South Africa. Every time I was with him, I had a tear in my eye because I couldn’t get over the love that existed in this man. Chris: I don’t like to use the word failure, but what is one learning opportunity that stands out through your career? Gary: A difficult thing for me was that I lived in South Africa and had to continuously fly over to America to play the Tour. I was on my own, away from my country, away from my family, away from my wife, and away from my friends. It was a very big sacrifice. There weren’t big sums of money that they’re playing for today, nowhere near. I mean it was really hardly any money at all. It was a very, very different situation than the guys in America. They played the Tour, finished on a Sunday, and then went home for a couple of days and then came out the next week to play. They really didn’t know what it was to have loneliness and be away from your loved ones. Chris: What is one comment you have about the way we should interact with society? Gary: I think if we can use biblical terms: A) do unto others as you’d like done unto you. B) don’t forget to honor your mother and your father. Chris, most young people today tell their mother and father what to do. They have no respect and this is where American education is so poor. We’re not teaching the children the things that used to apply in America when I first came here, of prayer in school, of gratitude. America is very much a Christian country, so can you not just say a prayer that suits everybody? “Thank you, dear Lord, for this wonderful country. I’m blessed to live in it. Amen.” Can you not just say, “Thank you?” That’s not going to do any harm. It’s only going to do good. Doesn’t matter whether you’re a Muslim, whether you’re a Christian, whether you’re a Jew, whether you’re a Hindu, whatever, it doesn’t matter. Just say thank you. I think there should be better forms of education other than purely academics; like manners. When I first came to America and I met a young boy, I’d say, “How are you, son?” He’d say, “Fine. Thank you, sir. How are you?” Now, you just do a test, Chris. Just do a test, and 10 out of 10 you’ll find a surprise. You’ll go up to a young boy and say, “How are you?” All he’ll say is, “Good.” That’s all. Nothing else. Chris: Going back to the biblical terms that you said above, I say a quote: “There’s no prophet in a man’s own land”. How has that applied in your own life? Gary: I get far more recognition in America and England than I do in South Africa. But I’m not a person who strives for recognition. When I think of my success, I always wanted to have the best world record. Now, I don’t have the most majors but I have almost the most amount of tournaments in the world and I have the best world record. I had dinner with President Eisenhower and he said, “America is a global society and I’ve got to keep it safe.” I remember that, “I’ve got to keep it safe.” He said, “If the country is safe, we will invest in ourselves and other people will invest in us.” You tell me how many places in the world today are safe. Chris: What inspires you about being the underdog? Gary: When I think of the success I’ve had as a small man coming from a small country like South Africa, I never take credit. I never think it’s me. I’m not trying to be humble but I never start thinking how good I am. It’s purely a gift, a loan. It can be taken away any minute, as has been taken away by many, many champions overnight. “The harder you practice, the luckier you’ll get”. Chris: Who is your higher power? Does it have a name or a face or a description? Gary: I pray to the Lord and Jesus, that’s who I pray to. And I just am grateful when I hear people having any religion in their heart, whatever religion or culture it may be. My favorite pastor is Dr. Billy Graham. He has had a great influence on me. Chris: What’s the first thing that you do when you wake up in the morning? Gary: The first thing I do when I wake up, I realize how fortunate I am. I think the word is gratitude. When I arrive here at Augusta National for The Masters Tournament; I always get out of the car, walk down Magnolia Lane, and say a prayer of “Thank You”. I’ve won a lot of tournaments but here I won three Masters. I’ve been in the top ten 14 times, second 3 times, had the most number of putts in a row, played in it the most number of times, and here I am in my sixtieth year coming back to this tournament. For gratitude, look at what your parents do, look at your friends do, look at the fact that you have three meals a day. Most people in America and the West, they’ve got too much of an entitlement attitude. We’re not entitled to a damn thing, man, Chris. We’ve got to earn it the old-fashioned way. No giving things away, you’ve got to earn it. Now, I do believe when it comes to people that have fought for your country and people that don’t have a certain amount of salary we should be taking care of them, looking after those people. But as just an entire giveaway program, no, I don’t believe in that. We’ve got to remember charity is very important. Chris: Speaking of charity, tell us about some of the important work you’re doing at your Foundation. Gary: In South Africa, where I live, President Mandela and I have been able to build schools for young children. We’ve changed their lives. I think that’s such an exciting thing, to be able to change lives, give them a place in the sun. Chris: How do you deal with tragedy? Gary: I accept death in a different way to most people do. I don’t accept it like it’s a tragedy, it’s basically a celebration going off into a better place. Yesterday, I had one of my dear friends pass away. He used to work with me in my farm, and he worked with me for over 40 years. But I tell you something, I wake up in the morning and realize just how fortunate I am. If you think about what’s happening in the world today, there are some places that have one meal for two days, they don’t have any clothes, they don’t have any blankets, they don’t have a shower, they don’t have a TV set, they don’t have an air-conditioned room, they don’t have a car. They don’t have anything. Chris: How many meals do you eat per day? Gary: I say that you should only really eat when you’re hungry, not eat just because your mother and father tell you. If they say you have three meals a day, then you automatically sit down to three meals a day. Personally, I believe you eat breakfast like a king, lunch like a prince, and no dinner. When I’m on my farm, two, three nights a week I have no dinner. And when I do have dinner, it’s a handful. It’s a little salad or a lot of mashed vegetables put together, and that’s it, no bread, no meat, no chicken, no fish, no big beers and drinking at night and bread. You don’t put gas in your car when you park it in the garage at night. And when you go to sleep at night, you’re going into your garage. You do not need food in your stomach when you’re going to bed. A light, light, handful, one handful of food is sufficient at night. Chris: What are 5 keys things to living a long life? Be optimistic and happy. Laughter is the best medicine, and God gives it to you for nothing. If you fill your soul with laughter, it washes your soul. Depression and feeling sorry for yourself makes you weak. Exercise. People are getting so overweight, and obesity is creeping in, and diabetes is a rampant disease. Gratitude and perspective. I think gratitude is something that is taught to us or should be taught to us from the day that we’re born. Love in your heart which puts you at peace. If you have bad thoughts about others, replace them with pleasant thoughts. The less you eat, the longer you live. You’ve got to be thin to win. There’s an old saying in the horse business, the longer the race, the leaner the horse. Gary: I’ve got to go now, Chris. I’ve just arrived at the clubhouse at Augusta National, and they won’t allow a cell phone. Chris, it’s been an absolute pleasure talking to you, and my love to all your friends, and keep up the good work. If we can be on this earth and try and contribute to society, and make good changes, and learn from each other, and have the love that is necessary, I think it’s going to be, we can all help to make it a better world. Chris: Thank you, sir. God bless and take care. Gary: Thank you. Same to you, my friend. Big thanks to Megan Ananian + Bo Wood for arranging.